Black Friday sales were known at one time as After-Thanksgiving." But the phrase the retail world uses for returning to profit, or into the black from the red has stuck. No matter the name, retailers shell out a lot of coin every year to make sure customers know what deals are there for the taking. 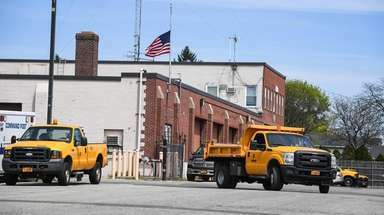 Long Island is no exception. Here are some Black Friday, or After-Thanksgiving advertisements through the years. 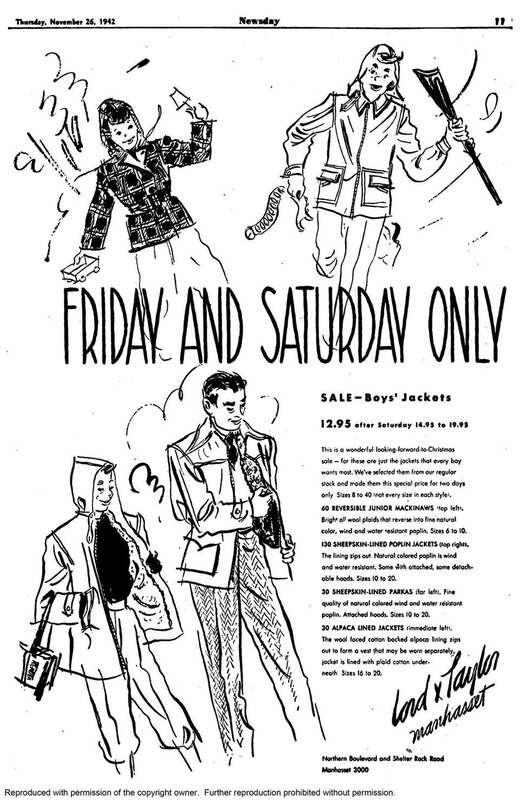 This Lord & Taylor ad ran in Newsday on Thanksgiving Day 1942. The Manhasset store was open the Friday and Saturday after Thanksgiving. This ad for the Arnold Constable clothing store in Hempstead ran on Thanksgiving Day 1942, during World War II. 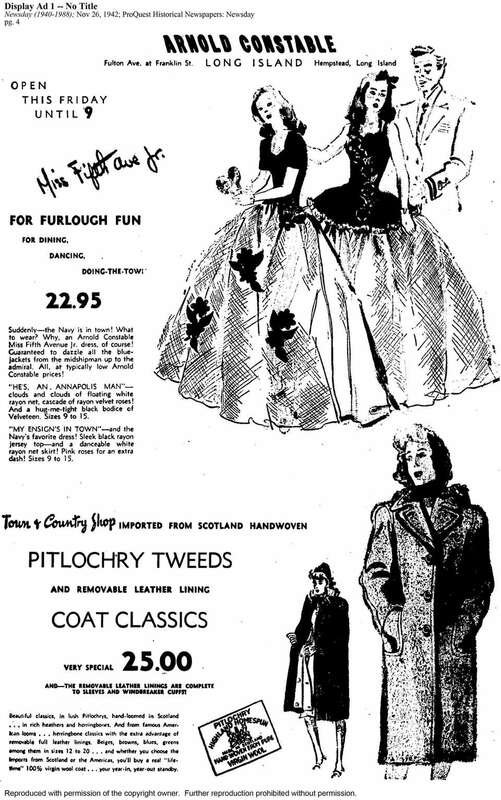 The ad featured women's coats and dresses that might be appropriate, "for furlough fun" with the Navy in town. The store was open late the day after Thanksgiving. 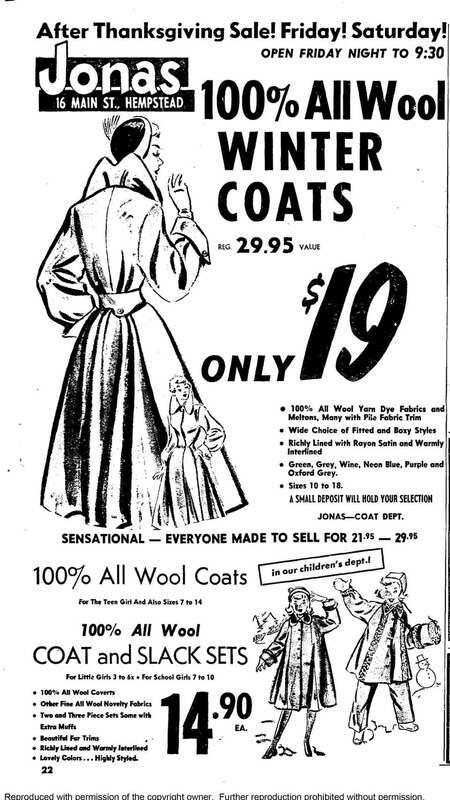 In 1951, the Jonas department store in Hempstead featured winter coats for $19 in its After-Thanksgiving sales. 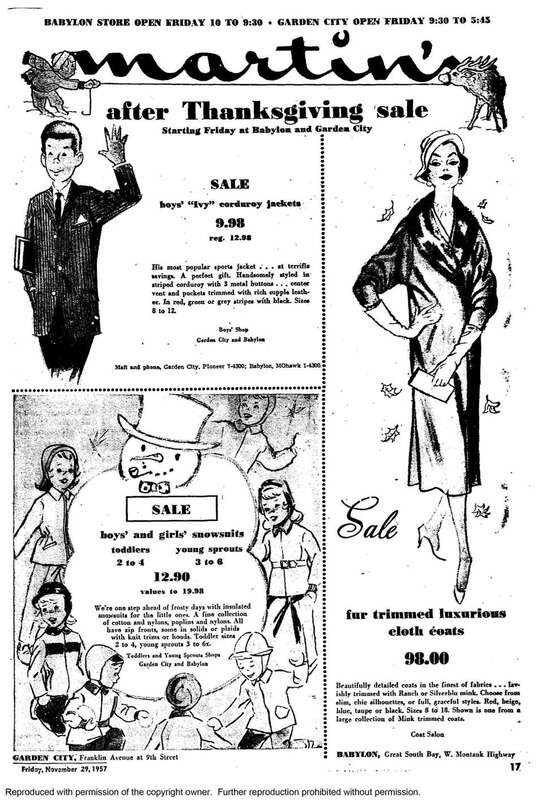 This ad for Martin's department store's After-Thanksgiving sales ran in Newsday on Nov. 29, 1957. 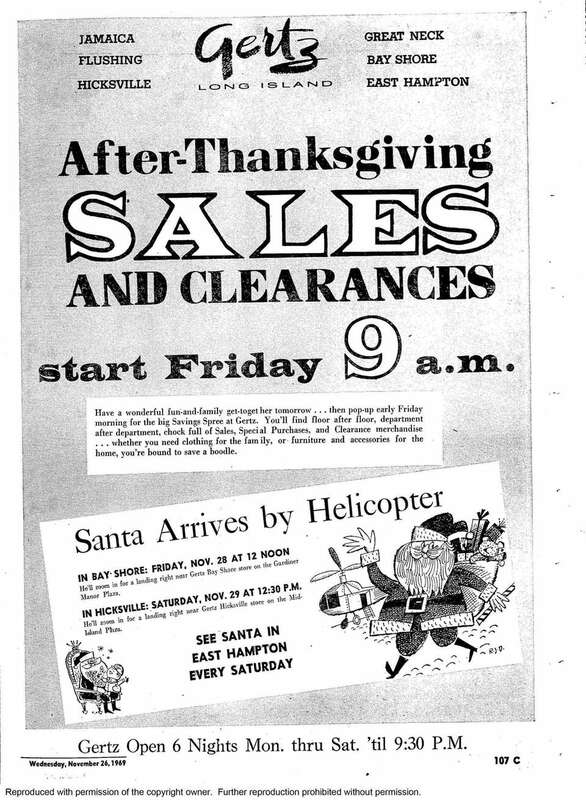 In 1969, Santa came to Roosevelt Field via helicopter, according to this ad in Newsday. 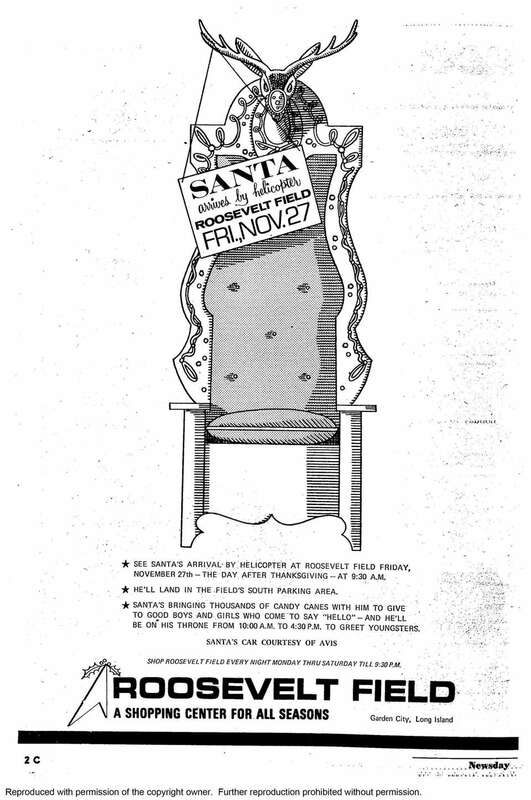 Santa was slated to arrive by helicopter for the After-Thanksgiving events at Gertz locations in Bay Shore and Hicksville, according to this ad that ran on Nov. 26, 1969. 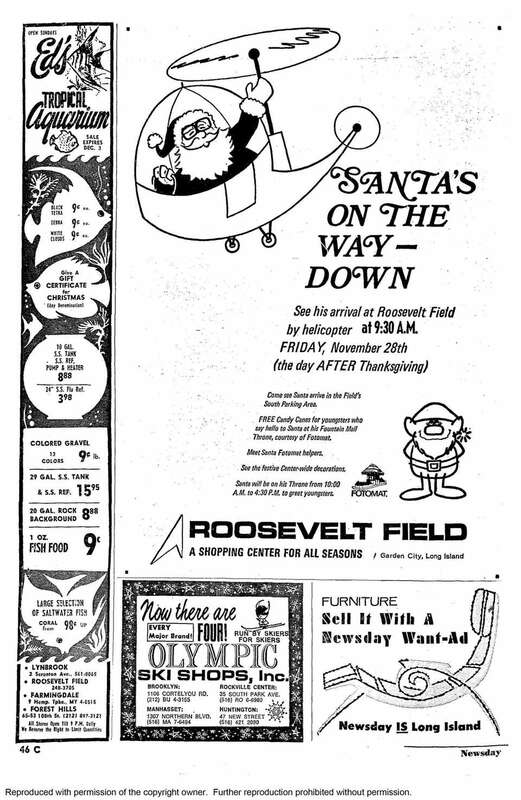 Santa was to make his way to the Roosevelt Field mall by helicopter on Nov. 27, 1970 the day after Thanksgiving, according to this ad in Newsday in November 1970. 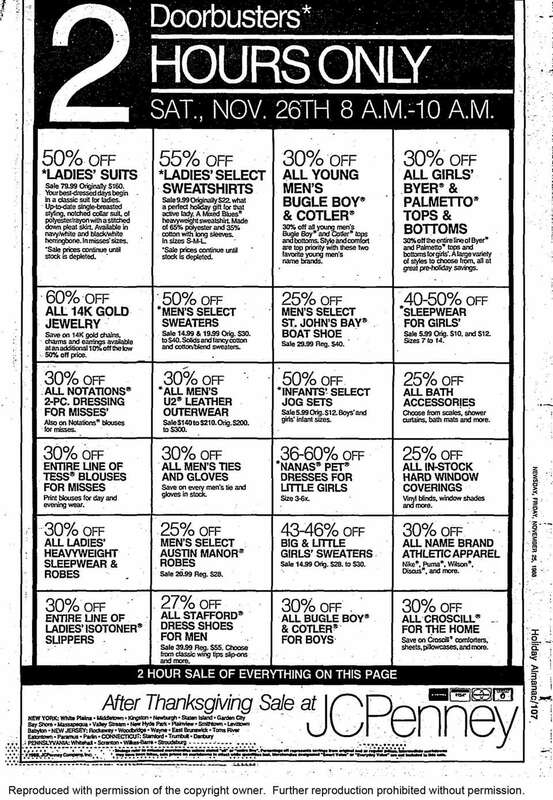 After-Thanksgiving sale ad for Gertz department store outlets that ran in Newsday on Nov. 27, 1974. 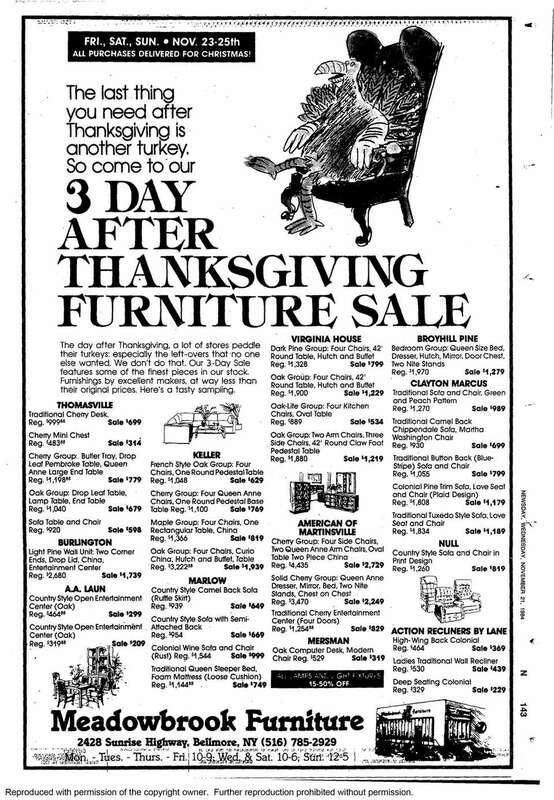 This Gertz department store ad on Nov. 23, 1979, for After-Thanksgiving sales featured furniture and carpets. 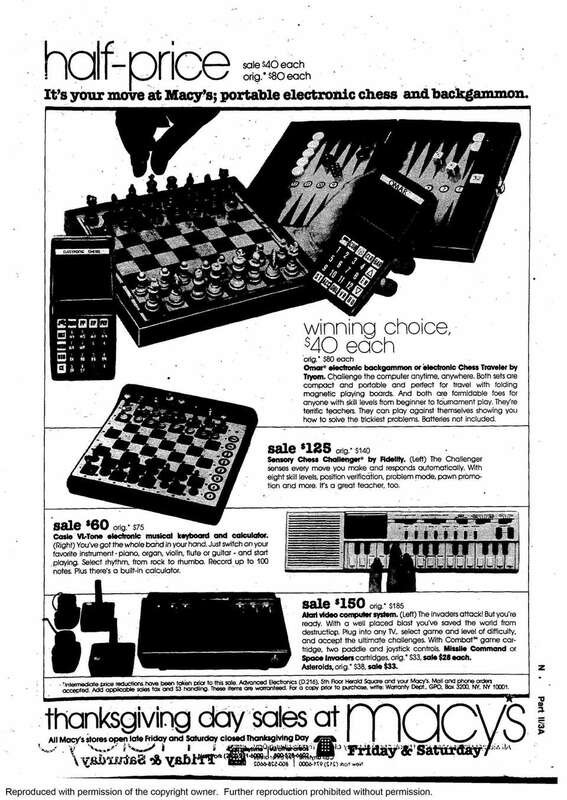 This Macy's ad from Nov. 25, 1981, featured electronic chess and backgammon games on sale Thanksgiving Day. 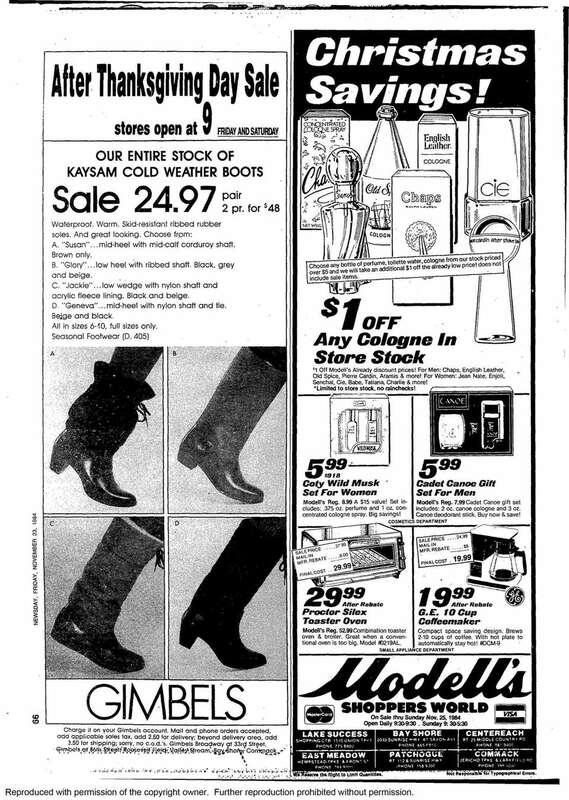 This page from a November 1984 Newsday features After-Thanksgiving sales at Gimbel's department store and from Modell's Shopper's World. 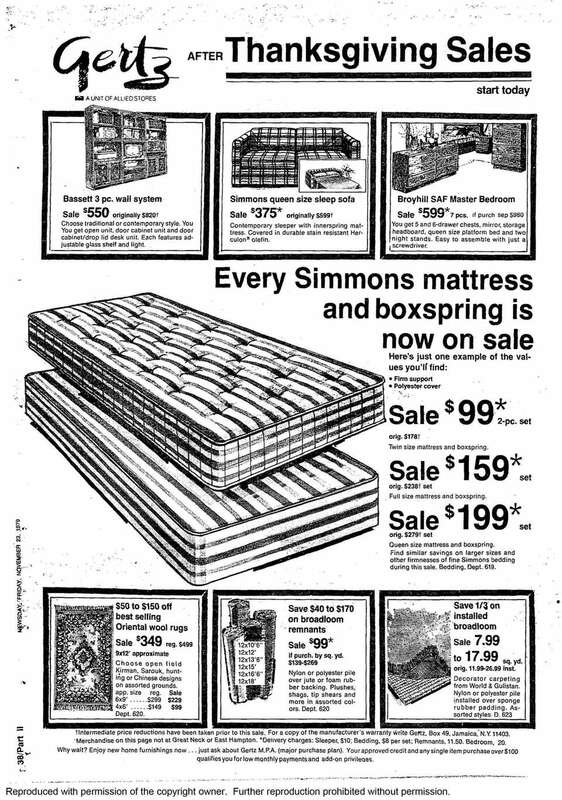 On Nov. 21, 1984, Meadowbrook Furniture in Bellmore ran this ad for a three-day sale. The store said that the sale included their finest pieces, because, "the last thing you need after Thanksgiving is another turkey." 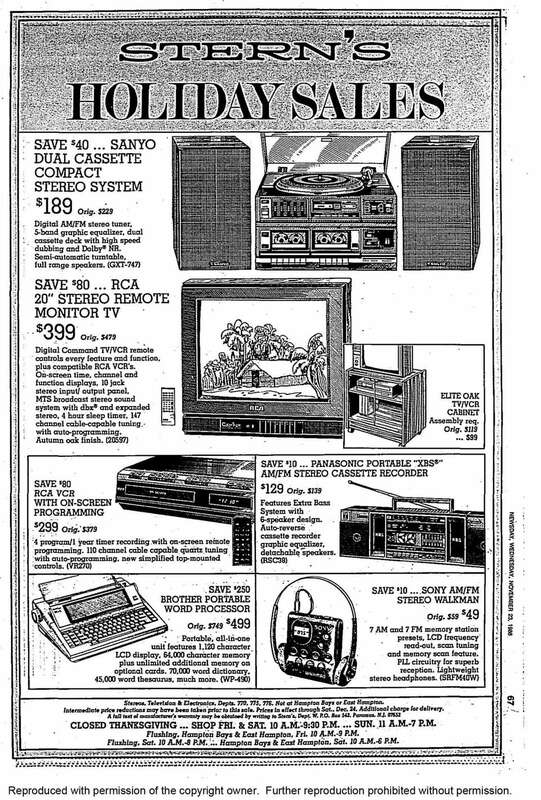 A Bloomingdale's ad featured a boombox, a Walkman and a SONY beta VCR on sale after Thanksgiving in 1984. 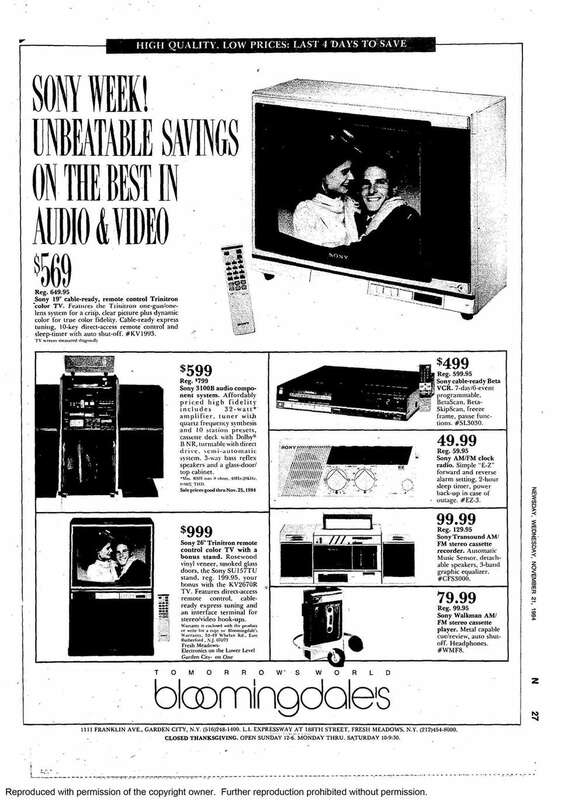 This Stern's department store ad that ran on Nov. 23, 1988 featured holiday sales for electronics, including a SONY Walkman that was a bargain at $49. The sales started the day after Thanksgiving. 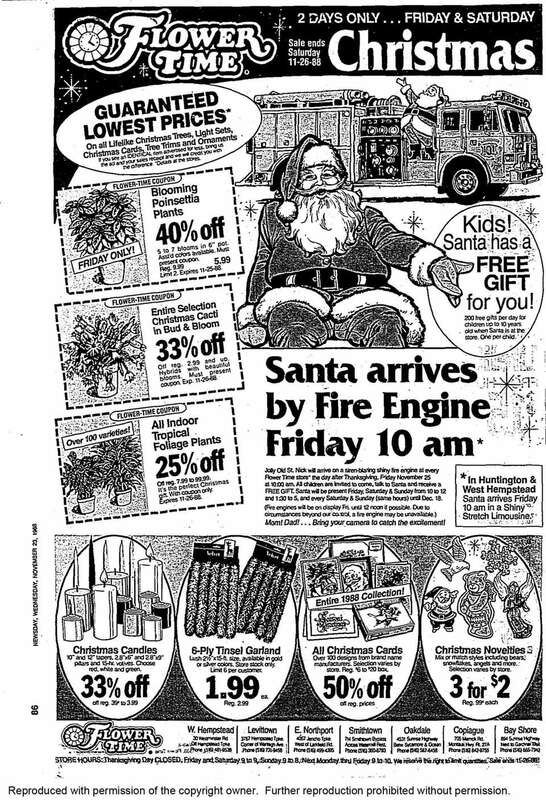 Santa was set to arrive by fire engine at most Flower Times stores in November 1988. Santa switched to a "shiny black limo" for his visits to the Huntington and West Hempstead locations. 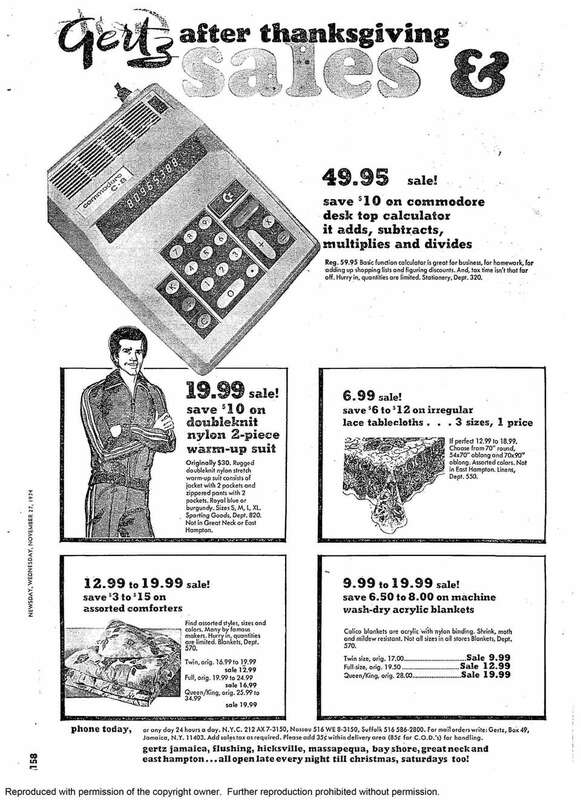 This J.C. Penney ad from Nov. 25, 1988 featured early doorbuster sales for the Saturday after Thanksgiving. 8 things not to buy on Black Friday Black Friday sales are sure to be plentiful this year, but buyers beware: Not every item is expected to be at its best price on Nov. 22. Dealnews.com says these are 8 things to avoid.